An electrode designed like a pomegranate – with silicon nanoparticles clustered like seeds in a tough carbon rind – overcomes several remaining obstacles to using silicon for a new generation of lithium-ion batteries, say its inventors at Stanford University and the Department of Energy’s SLAC National Accelerator Laboratory. 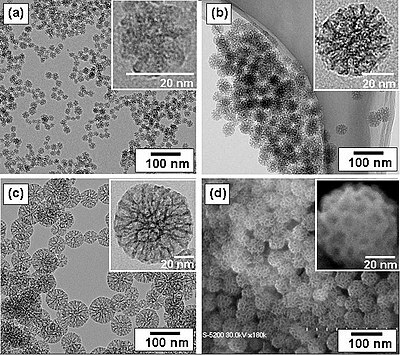 Transmission electron microscopy(a, b, and c) images of prepared mesoporous silica nanoparticles with mean outer diameter: (a) 20nm, (b) 45nm, and (c) 80nm. Scanning electron microscope(d) image corresponding to (b). The insets are a high magnification of mesoporous silica particle. “While a couple of challenges remain, this design brings us closer to using silicon anodes in smaller, lighter and more powerful batteries for products like cell phones, tablets and electric cars,” said Yi Cui, an associate professor at Stanford and SLAC who led the research, reported today in Nature Nanotechnology. The anode, or negative electrode, is where energy is stored when a battery charges. Silicon anodes could store 10 times more charge than the graphite anodes in today’s rechargeable lithium-ion batteries, but they also have major drawbacks: The brittle silicon swells and falls apart during battery charging, and it reacts with the battery’s electrolyte to form gunk that coats the anode and degrades its performance. Over the past eight years, Cui’s team has tackled the breakage problem by using silicon nanowires or nanoparticles that are too small to break into even smaller bits and encasing the nanoparticles in carbon yolk shells that give them room to swell and shrink during charging. While these experiments show the technique works, Cui said, the team will have to solve two more problems to make it viable on a commercial scale: They need to simplify the process and find a cheaper source of silicon nanoparticles. One possible source is rice husks: They’re unfit for human food, produced by the millions of tons and 20 percent silicon dioxide by weight. According to Liu, they could be transformed into pure silicon nanoparticles relatively easily, as his team recently described in Scientific Reports. The research team also included Jie Zhao, Matthew T. McDowell, Hyun-Wook Lee and Wenting Zhao of Stanford. Cui is a member of the Stanford Institute for Materials and Energy Sciences [SIMES], a joint SLAC/Stanford institute. The research was funded by the DOE Office of Energy Efficiency and Renewable Energy.